DISCLOSURE: I was provided the product sample seen in this post. In addition, some of the links in this post contain affiliate links, which come at no cost to you. Know that I only promote products I personally use and stand behind. To learn more about my affiliates, please review my disclosure policy here. 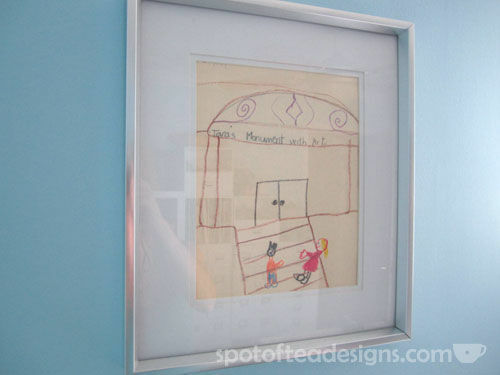 This is a drawing I made in elementary school on one of my manila folders that is now framed and hanging in my craft room. “Tara’s Monument with Art”. Not “of art” but “with art”. So maybe I didn’t have the greatest grammar skills, but I was a young artist. My sister, Melanie, on the other hand, did not get the handmade gene. Sure she can color and do basic crafts, but she doesn’t have the passion for it like I do. Right now, she’s working on her skills to be a great mom to my little nephew Blake, who just celebrated his first birthday. Since Melanie isn’t into the whole handmade card thing, I was very excited when I was surfing around the Tiny Prints site and discovered they had personalized kid stationery to write notes on! If you don’t know, Tiny Prints is a sister site to Wedding Paper Divas, the site I used for bridal shower invitations, my save the dates and my wedding invitations. Readers of my blog have definitely heard me rave about the awesome printing and customer service of WPD before, so it didn’t take much to hop on board the Tiny Prints train too! Check out their collection of birth announcements, party invitations and stationery for babies and kids. 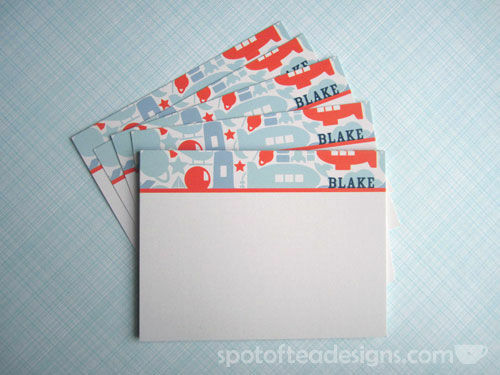 I thought this Fun Skies design, personalized with Blake’s name would be a great solution for my sister if she needed to write a quite thank you or note on behalf of Blake.